The anonymous street artist Banksy released a series of new works Wednesday in Gaza, all commenting on the dire situation of the 1.8 million Palestinian residents confined to the area. One of the works is a short documentary posturing as an advertisement for the region, sarcastically framing the desolate territory as the next hot tourist destination. The doc, allegedly shot by Banksy himself, begins with the artist traveling through a "network of illegal tunnels" to enter Gaza, where he proceeds to create stencil artworks among the ruins and rubble that mark the locale. "Make this the year YOU discover a new destination," the film flashes, interspersed with images making the brutal reality of life in the Gaza strip painfully clear. "Gaza is often described as ‘the world’s largest open air prison’ because no-one is allowed to enter or leave," Banksy's website explains. "But that seems a bit unfair to prisons -- they don’t have their electricity and drinking water cut off randomly almost every day." Along with the short film, Banksy scattered a variety of artworks around the region, one which reads in red ink, "If we wash our hands of the conflict between the powerful and the powerless we side with the powerful -- we don't remain neutral." Other images depict children swinging from an Israeli surveillance tower, and an image of the Greek mythical figure Niobe -- the Queen of Thebes whose 14 children were murdered in a jealous rage. A third image depicts a kitten playing with scrap metal like a toy. 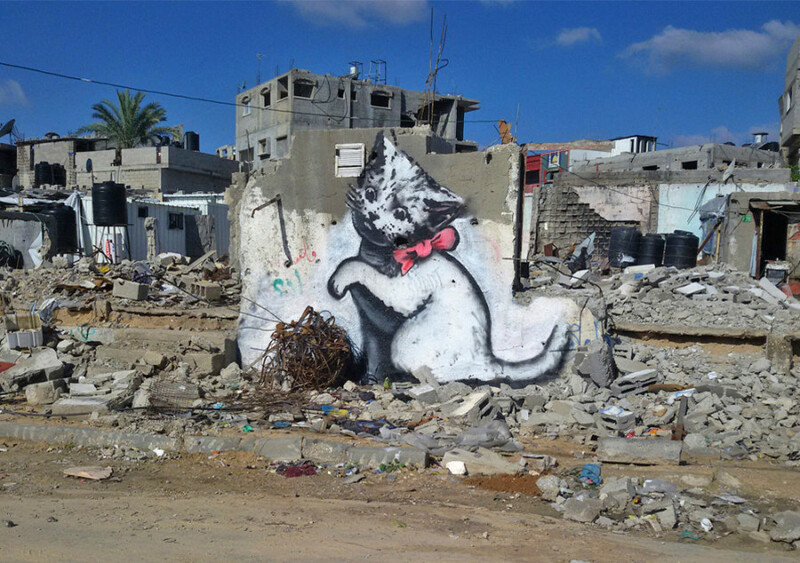 "The cat tells the whole world that she is missing joy in her life," a Palestinian man explains in Banksy's documentary. "The cat found something to play with. What about our children? What about our children?" Banksy supplied a second explanation on his website. "A local man came up and said ‘Please -- what does this mean?' I explained I wanted to highlight the destruction in Gaza by posting photos on my website -- but on the internet people only look at pictures of kittens." Banksy has been vocal for years about his support for the Palestinian cause. In 2005, he created artwork on the Israeli West Bank barrier, explaining the sentiment to The Independent. "The segregation wall is a disgrace. On the Israeli side it's all manicured lawns and SUVs, on the other side it's just dust and men looking for work. The possibility I find exciting is you could turn the world's most invasive and degrading structure into the world's longest gallery of free speech and bad art. And I like to think I can help with that bit." 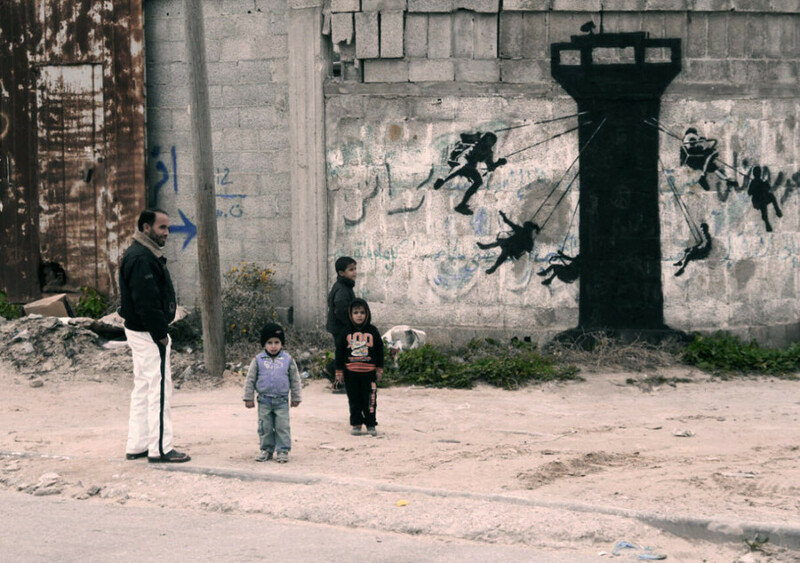 See Banksy's new Gaza pieces below and let us know your thoughts in the comments.